But is this the one we'll actually get? HTC has been long rumored to be making a smartwatch – the first murmurs started all the way back in 2013 – but a new leak shows off a round device that may actually come to your wrist. 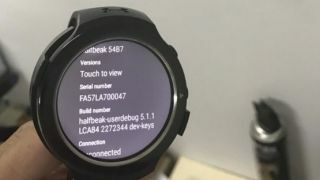 Codenamed the HTC Halfbeak, the smartwatch has leaked in images on the Chinese social networking site Weibo. It looks to come with a round display and a screen resolution of 360 x 360 pixels. On the back is a heart rate sensor as well as a four pin charger connection, while the strap is made of plastic. One of the images does show the plastic strap breaking a little though, but that may be an issue with an early development unit. Under Armor are partnering with HTC for this smartwatch. It would make sense as the two companies would work together on this after the two collaborated on the Under Armor Band earlier in 2016. Whether this HTC smartwatch ever makes it to market is a different question. The HTC Grip wearable was long delayed after the announcement and only came to market after it was renamed with the Under Armor brand. We've even seen square smartwatches leak from HTC in the past, but so far none of them have been officially announced or release. HTC's CEO Cher Wang said in February this year, "When HTC comes out with a smartwatch, we will turn the industry on its head." That's a confident statement and it may be the HTC Halfbeak was at the back of her mind when she said that. In terms of a release date, we are going to have to wait a while longer for official word from HTC.